Reliable Controls® is pleased to announce the release of RC-Reporter®, a web-based application that lets users efficiently sift through their large volumes of archived building data or imported CSV files, and quickly tag relevant points for analysis and report generation. Filtered and categorized data is then linked to a variety of modular report components, which produce line, bar, and pie charts, and profile, correlation and exception graphs. The components are then dragged and dropped into a report layout, and embellished with text, images, background, and borders to produce a professional looking document. Standard and advanced querying allows for deeper analysis when needed. Automated report distribution allows users to share their reports through email with attached PDFs or embedded links. Distech Controls, an innovation leader in energy management solutions, has announced the launch of both its ECLYPSE™ Connected IP and Wi-Fi Product Series, and ENVYSION responsive, web-based design and visualisation interface. Providing powerful connectivity and advanced control, monitoring and analysis, these new offerings prepare users for the Internet of Things building. The ECLYPSE Connected System Controller is a modular and scalable platform providing BACnet/IP, wired and wireless IP connectivity, permitting integration with building management systems and convergence with IT networks. ENVYSION, web-based graphic design and visualisation interface, delivering the art and science of actionable visual knowledge and powerful user experience. 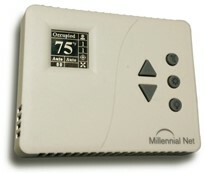 Millennial Net announced today the release of its 3rd generation wireless/standalone electric thermostat, Wi-Stat IIIe. It is designed for easy retrofit to existing HVAC infrastructures without disruptive and expensive rewiring. Wi-Stat IIIe replaces existing manual, analog or programmable thermostats and can support most single- or dual-stage conventional heating and cooling as well as heat pump systems. The new Wi-Stat IIIe combines the best of two worlds: • It can be used as wireless thermostat in large multi-zone buildings as part of a centralized Building Automation System (BAS); or • It can act as a conventional digital 5/2 day programmable thermostat. For more information visit http://www.millennialnet.com/Wi-StatIIIe. Weiser®, the leader in residential door hardware, introduces Android™ compatibility to the breakthrough Kevo™ smart lock. Consumers with Android 5.0 Lollipop (L) software on supported devices can download the beta Kevo app on the Google Play store to experience Kevo’s functionality. Android L customers can now download and use the beta Kevo app to experience Kevo, while Weiser continues to enhance the performance and functionality of the official app. Android L devices are the first from Android that fully support Bluetooth® Smart peripheral mode, which is needed for Kevo compatibility. 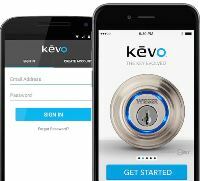 Bluetooth Smart technology ensures a low energy, seamless connection from the Kevo deadbolt to authorized devices. NK Technologies announces the publication of a new comprehensive catalog featuring its extensive portfolio of current, voltage and power measurement products. 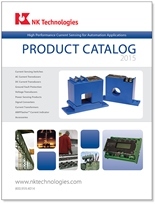 The 114-page catalog includes performance data, sizes, specifications and technical references for the company’s line of current sensing switches, transducers, transformers, ground fault protection and other products. Featured in the new catalog are NK Technologies’ recently-introduced AT/ATR AC current transducers—designed with split-core housings and the capacity to monitor up to 1600 amps without disturbing existing wiring. The new transducers are designed to mount on a DIN rail or attach to a control panel, providing the same reliability and accuracy that NK products are known for worldwide. The intrinsically safe EE300Ex humidity & temperature transmitter from E+E Elektronik conforms to the European ATEX Directive and now also to the international IECEx and the FM classification specifically relevant to the USA and Canada. This makes the device suitable for worldwide usage in explosion hazard areas. The EE300Ex was developed for use in explosion hazard environments and can be mounted directly in both gas and dust hazard areas of zone 0 / Div1. Precise humidity and temperature measurements from 0…100 %rel. hum. and -40…180 °C (-40...356 °F) are also possible in applications under pressure up to 300 bar (4351 psi). Just as with humidity measurement in air, the EE300Ex can also be used for moisture measurement in oils. BACnet Router carries BTL Certification for Protocol Revision 12. Sierra Monitor Corporation (OTCQB: SRMC), a provider of Industrial Internet of Things (IIoT) solutions that connect and protect high-value infrastructure assets, today announced that its FieldServer BACnet Router has been certified by the BACnet Testing laboratory (BTL), having successfully passed the Protocol Revision 12 router tests. The product is the first one in its class to pass the new Protocol Revision 12 tests. 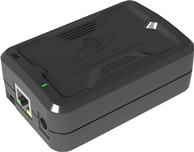 The FieldServer BACnet router is a complete internetworking solution for BACnet/IP, BACnet MS/TP, and BACnet/Ethernet. With its use of two RS-485 ports, the product reduces the cost of connecting each BACnet MS/TP device to a BACnet/IP backbone or doubles the responsiveness of each connected device relative to other options in the market. A simple one-page configuration screen along with a unique one-click discovery feature that allows the integrator to discover all connected BACnet devices minimizes the time required for successful commissioning. Magnum Energy Solutions, a leading provider of wireless, self-powered energy management technology, today announces the introduction of its eBox BACnet gateway. This allows wireless end devices to be integrated into wired building automation systems (BAS). The eBox automatically translates incoming wireless messages into BACnet IP objects. These data points can then be used by BAS that utilize the open standard BACnet, which is quickly becoming the standard for building automation. The eBox can leverage an existing Ethernet infrastructure or it can utilize WiFi. Each eBox covers between 5,000 to 8,000 square feet of wireless range and can listen to an unlimited number of incoming wireless transmissions, with the ability to bi-directionally control up to 128 unique devices per eBox. Columbia Weather Systems has added BACnet interface for the building automation industry to the Weather MicroServer™. This tool is available for any CWS model weather station. Professional weather stations offered by CWS are used for critical weather monitoring in industries and government agencies worldwide. Model options include all-in-one sensor suites, as well as modular sensor selection. All models are available in fixed, vehicle, and portable configurations. Weather data monitoring can be accomplished through computer software interface, display console, and/or the proprietary Weather MicroServer with industrial protocols and Internet interface. The IndigoVision Compact NVR-AS 4000. Small size. Huge performance. Installs just about anywhere. Recorded evidence shouldn't just be usable. It should be exceptional. IndigoVision's Network Video Recorders (NVRs) give you that extra peace of mind knowing that your security system will be recording 24/7. Choose a specific NVR model for your installation requirements or mix NVR models, you'll still get the same amazing user experience. Perfect for small or distributed installations, the IndigoVision Compact NVR-AS 4000 can record up to 20 Cameras and has 1TB single drive storage. Less than 5cm tall and weighing less than 1Kg, the IndigoVision Compact NVR-AS 4000 is so discreet and robust, you may forget it's there. NK Technologies introduces ASXP-LS Current Switches – a combination current transformer and signal conditioner designed specifically for monitoring large loads. The ASXP-LS Current Switches feature electromechanical relay output, external power source, simple field setpoint adjustment and easy installation. The mechanical relay contact provides a trouble-free, durable alarm or interlock, improving safety and overall system reliability, while the selectable “Fail Safe” operation provides protection for critical loads. ASXP-LS Current Switches are used to monitor large machines for over- or under-load conditions, detect open discharge lines and sense clogged filters. They can also monitor generators to shed non-critical loads when demand reaches a set level. Electro Industries / GaugeTech (EIG) announced the release of the Shark® 50B meter with native BACnet MS/TP serial communication. This meter supplies power and energy data to building automation systems using a native, standard BMS protocol. It is perfect for retrofit into existing systems or for new applications. The Shark® 50B meter comes pre-programmed with 34 BACnet objects for seamless integration into existing BACnet networks. It offers an affordable entree into the world of building automation. In addition to building automation, it supports LEED projects and other "green" building initiatives. The meter also supports Modbus over TCP/IP so that the Shark® 50B meter can additionally communicate to a stand-alone energy management system or energy dashboard. This allows the meter to be used for both energy management and building automation applications simultaneously.